The edited and illustrated proceedings of an April 2018 IFAR Evening in which four speakers discussed the increasingly popular and frequently faked artist Amedeo Modigliani. 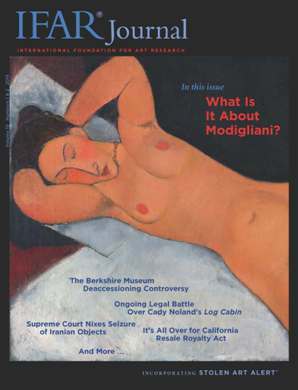 Kenneth Wayne, director of The Modigliani Project and director of a new Modigliani catalogue raisonné project, focuses on the importance of the artist and provides an overview of the various Modigliani catalogues raisonnés. In a joint presentation, Lena Stringari, Deputy Director and Chief Conservator, Solomon R. Guggenheim Museum and Foundation, and Isabelle Duvernois, Conservator, Paintings Conservation Dept., The Metropolitan Museum of Art, discuss their research on Modigliani nudes in their respective museums as part of the international Modigliani Technical Research Study. Marc Restellini, Founder and Director, Institut Restellini, Paris, discusses his efforts to stop the spread of Modigliani forgeries and the protocol he has developed to compile a database of the results of his Institut’s scientific analyses of more than 400 works. A discussion of the issues surrounding deaccessioning of artworks by debt-ridden museums to meet operating expenses, most recently the Berkshire Museum, which consigned 13 works from its collection to Sotheby’s for the Spring 2018 sales, several of which are illustrated in the article. Critical of museums that use proceeds of sales of works for this purpose, the Association of Art Museum Directors (AAMD) issued sanctions against the Berkshire Museum. The sons of artist Norman Rockwell, two of whose works were deaccessioned, and the residents of Pittsfield and Berkshire County, unsuccessfully tried to prevent the sale. A report on a February 2018 U.S. Supreme Court ruling that a collection of Iranian-owned artifacts on long-term loan to the University of Chicago’s Oriental Institute since 1937 cannot be seized and used as payment to the families of victims of terrorism for a 2003 judgment against Iran. A discussion of a legal case concerning the removal from a May 14, 2018 Sotheby’s New York auction of a bronze Greek horse dating from the ca. 8th century BC after the Greek Ministry of Culture sent a letter declaring Greek ownership of the object. The auction featured works of art from the Howard and Saretta Barnet Collection. An update on the legal battle over an ancient Greek bronze statue in the collection of the Getty Museum since 1977. For the third time, a court in Pesaro, Italy ruled in June 2018 that the work must be returned to Italy. The Getty has said it will appeal. A discussion of Davidson v. United States, wherein the sculptor Robert Davidson sued the U.S. Postal Service for copyright infringement after the USPS released a “Lady Liberty” stamp featuring an image of the face of a plaster replica of The Statue of Liberty” that Davidson had created for a Las Vegas hotel in 1996. An update on a story covered at length in previous issues of IFAR Journal. In July 2018, the Ninth Circuit Court of Appeals upheld a lower court decision striking down all but a small part of the California Resale Royalty Act (CRRA), the only artists resale royalty act in the U.S.
A report on the latest development in a story covered previously in IFAR Journal (see Vol. 18, Nos. 2&3) concerning the artist Cady Noland’s suit against the Berlin-based Michael Janssen Gallery and others for their unauthorized conservation work on her 1990 sculpture Log Cabin, which, she asserts, infringed on her copyrights and violated her rights under both the Visual Artists Rights Act (VARA) and the New York Artists’ Authorship Rights Act (AARA). The case raises questions as to whether the work itself is copyrightable. An update on our cover story in IFAR Journal, Vol. 18, No. 4 regarding the landmark case Cohen v. G & M Realty L.P., wherein 21 graffiti artists successfully sued real estate developer Gerald Wolkoff for whitewashing, without prior notice, the 5Pointz building that they’d painted. Wolkoff filed post-trial motions requesting that the judge reconsider his ruling, which, in June 2018, the judge decided not to do. In Brief: Guelph Case Can Proceed in U.S.
An update of a legal case reported previously in IFAR Journal (see Vol. 18, no. 1) in which the heirs of a consortium of German-Jewish art dealers are suing Germany for the restitution of the Guelph Treasure (the “Welfenschatz”), a collection of valuable Medieval Christian relics, which, the heirs assert, the consortium sold under Nazi duress to the State of Prussia in 1935. In July 2018, the U.S. Court of Appeals for the D.C. Circuit partially affirmed a lower court’s decision to allow the heirs to proceed with their lawsuit. A 25% tariff on imports of Chinese art and antiques has been proposed in the U.S. trade war with China. The Cultural Property Advisory Committee (CPAC) is meeting to consider Algeria’s request for a bilateral agreement that would place U.S. import restrictions on designated types of Algerian heritage considered at-risk of pillage. An update on a Holocaust-era restitution art case covered exhaustively in previous IFAR Journal issues, von Saher v. Norton Simon Museum of Art at Pasadena. In July 2018, a Ninth Circuit appeals court in California ruled unanimously in favor of the museum, which can keep the two contested Cranach paintings. Stolen items include Paul Signac’s Le Port de la Rochelle, stolen from a museum in Nancy, France; Nicolas de Stael’s Le Fort Carré à Antibes, stolen in London, England; two drawings by Jean-Michel Basquiat: Mummy and Self Portrait, stolen in New York; six paintings by Michelle Pearson Cooper stolen in Marrakech, Morocco. Recovered items include Robert Motherwell’s Untitled, stolen in NYC in 1978; Vaclav Brožík’s A Day at the Beach, missing in the U.S. since 1984; Tom McKinley’s A Very Small Penthouse, stolen in Los Angeles, CA; two Roman marble busts stolen in Byblos, Lebanon.